The term "deviled" in food dates back to the 18th century, and in the 19th century appeared in print referring to the use of particularly hot spices in cooking. These eggs are definitely deviled! - Hard boil eggs. To reduce cracking, place eggs in water prior to boiling, then bring to boil. Turn down heat; if you let eggs rumble in hard boiling water the whites will get tough and rubbery. - Add 1-2 tablespoons of vinegar to water, to help peel eggs. - Once hard boiled, place eggs in ice water to cool. The quicker the cooling, the less chance of having the eggs have that grey ring. Also, I find the colder the egg, the easier to peel. - Once eggs are peeled, cut in half and gently squeeze to remove yolk. Place hard yolks in bowl. - Crumble yolks and combine with remaining ingredients. 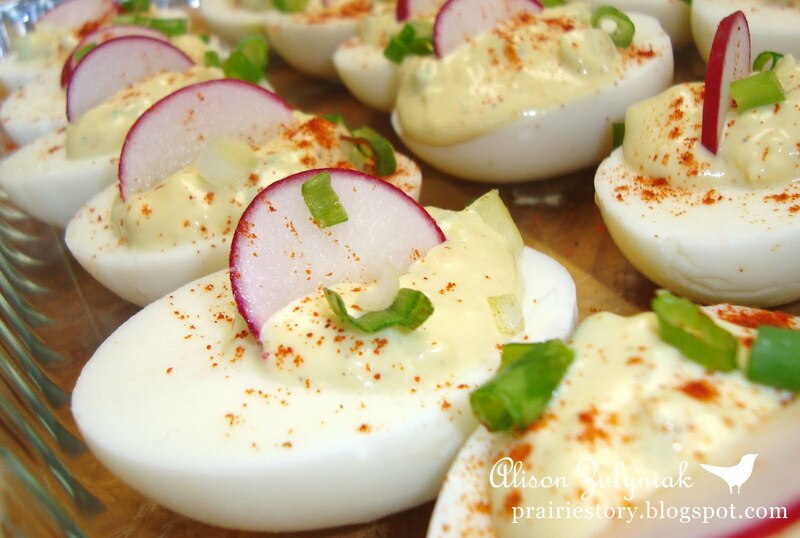 - Dollop filling in eggs, and garnish with paprika, chives and sliced radishes..
- Serve chilled. Makes 20-24 halves. What beautiful pictures. Those eggs look wonderful. I love eggs and I can have it for every meal ... this version of deviled eggs looks wonderful! I had to feature you this week on My Meatless Mondays. I have been making deviled eggs over and over, the past few weeks. I took one look at yours and I knew how to improve mine. Of course it would help if I knew what that Heinz English salad cream is. Share the secret, please. If you can't find it, a coleslaw dressing would be comparable.